With the FLEXPOINT® MVpico series LASER COMPONENTS presents the smallest line laser used in industrial image processing. Due to its small dimensions of just 53 mm in length and 10 mm in diameter, the lasers are optimally suited for integration in 3D image processing sensors. The MVpico is available at four wavelengths: 635 nm, 650 nm, 660 nm, and 785 nm. The maximum output power is 100 mW. Operation of FLEXPOINT® modules is notoriously simple; all that is required is a supply voltage between 4.5 and 30 VDC. Optionally, the power can also be adjusted using a control wire. Moreover, the laser modules can be triggered using a second control wire. The handling is particularly noteworthy. The line generated is focused without having to remove the line optic; furthermore, the power distribution is homogeneous along the line. We also offer custom solutions! All FLEXPOINT® laser modules are produced in house in Germany. Customizing laser modules to meet your specifications is part of our daily operations. Thus, the MVpico can be modified to suit your application. Inquire with us! Whether modifications need to be made to the output power, the housing, or other elements, often is more possible than you think! 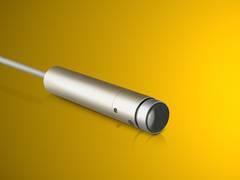 The FLEXPOINT® MVpico is with length of 53 mm, one of the smallest line laser for the industrial image processing.